The difference between victory and defeat for Gov. 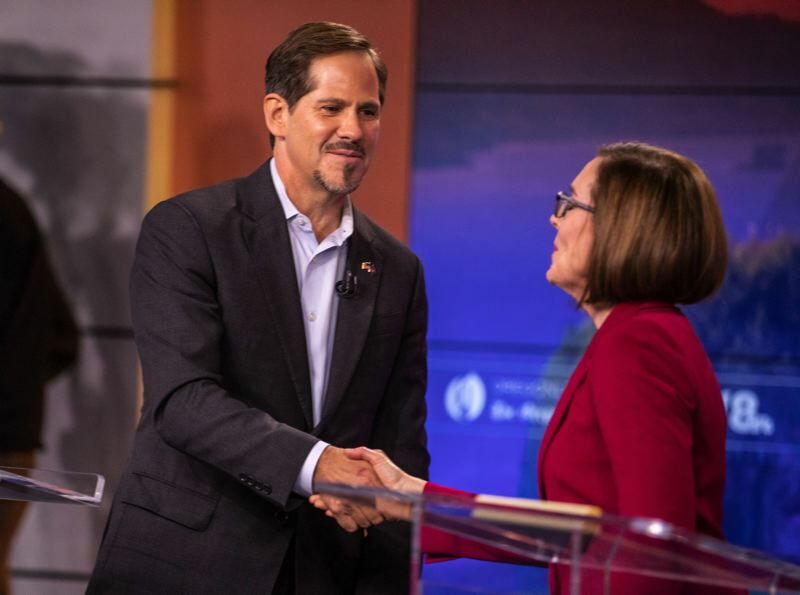 Kate Brown and Rep. Knute Buehler could hinge on voters in Clackamas and Washington counties, according to pollsters, policy analysts and campaign officials. Gov. Kate Brown and Rep. Knute Buehler have traversed the state in search of swing voters to court. They have debated public pension reform, health care, education and gun rights. They have coined catch phrases to distill their messages. In the final days of the campaign, the race is likely to be won or lost in Clackamas County, according to pollsters, campaign officials and political consultants. The county has gotten more liberal over the past few years, and local Democrats have ramped up voter outreach this year. While Portland is likely far too blue for Buehler to swing his way, analysts say the greater metro area remains the main battleground. "There's no doubt Kate Brown will win Washington County," said Kevin Looper, an advisor to Brown's campaign. "I think Clackamas County is up for grabs. The margin by which Kate Brown wins Washington, and wins or loses Clackamas, will resemble the margin in which she wins the state." The Oregon Republican Party won't yet concede Washington County. The county — teeming with independent and nonaffiliated voters — could be swayed by a competent candidate like Buehler, who recently snagged the endorsement of Oregon's largest newspaper, The Oregonian. "Kate Brown is an incumbent almost four years in office, and there is a raft of problems - crises that could devour the state budget and is already doing so in the case of the PERS crisis," said Kevn Hoar, communications director for the Oregon GOP. "She has shown no urgency to fix things and … that message is starting to reach people." Jordan Conger, Buehler's policy director, declined to comment on the campaign's internal strategy or specifically on Clackamas County but would say that Buehler has been spending the majority of his time in Clackamas, Multnomah and Washington counties, where the majority of voters reside. "There are a lot of voters who are not traditional and a lot of voters who maybe in the past voted Democratic that are very interested in new leadership and our message is resonating with them on issues he's campaigning on like homelessness and education," Conger said. So what are voters in those areas concerned about? John Horvick of independent political research firm DHM Research said they are directly afflicted by traffic, homelessness and the lack of affordable housing. Republicans in those areas are interested in the same issues as in Marion or Jackson counties: taxes and government spending, he said. But Horvick pointed out that Buehler has sidestepped the national pattern of riling the Republican base. He's not talking about abortion, immigration or gun rights to the degree that he's talking about Brown and her perceived failures on public pensions and education. He's going after Democratic voters who could be open to change. "His campaign is more organized around persuading persuadable voters," Horvick said. The strategy appeared to work through late September, as polls showed the race tied. However, a poll released Monday by Riley Research Associates for KGW showed Brown with a 49 to 45 edge with a margin of error of five. Looper, a strategist for Brown's campaign, said he thinks in the end voters would conclude Buehler's shifts on policy are disingenuous. "As that information continues to get out showing where candidate Buehler and legislator Buehler continue to be at odds, it becomes more clear that his strategy is to become something different than what he's been as a politician, and that makes people distrust what he's truly going to be if elected," Looper said. Peter Toll, the chairman of the campaign committee for the Clackamas County Democratic Party, said Democrats moving from Multnomah County in search of more affordable housing have dramatically changed the political demographics over the past few years. Milwaukie specifically has become a liberal enclave, he said. Democrats are mostly interested in health care, education and enhanced services. However, Toll and his 600 volunteers knocking on Clackamas County doors are engaging primarily with Democrats, he said. He didn't have a good sense of what potential Republican voters wanted. Hoar said some independent and nonaffiliated voters and even some Democrats in Clackamas County want someone like Buehler. "Clackamas County is a battleground. There is no doubt that Republicans tend to do better there … but both (Clackamas and Washington counties) have a lot of voters that sit right in Knute's wheelhouse," he said. "We know that area is rich with the kind of voters that Knute is attracting." Policy wonks can debate which issues play well in which precincts, but the average voter doesn't view elections that way, Looper said. They often go by feel, and Buehler, a surgeon, made a fortune at his private practice and has a conservative voting record, he said. Looper said the state is changing in that historical conservative strongholds, such as Pendleton, Hood River and Bend, are growing and becoming more liberal. It's a math question, not a geographical one, he said. Looper isn't alone. When asked where the race will be won, several pollsters and analysts pointed to the Portland suburbs. To win the governor's office, Buehler would have to take Washington and Clackamas counties and receive 30 to 35 percent of the vote in Multnomah County, said Jim Moore, politics professor and director of the Tom McCall Center for Policy Innovation at Pacific University. "You don't have to win by much, but you have to win in both of them," he said. "That is getting tougher over time especially in Washington County, because it's getting more Democratic." Tim Nashif of The Hoffman Research Group said its polling in September showed Buehler at about 22 percent in Multnomah County. The last time Brown and Buehler faced off was in 2012 when Brown was elected secretary of state. In that race, Buehler won Clackamas County by more than 2,000 votes, but Brown won Washington by about 20,000 votes. In Multnomah County, Brown won by 144,152 votes, which is a larger margin of victory than she got statewide. However, multiple pollsters said the 2012 race is not a good comparison. For one, a secretary of state race doesn't garner the attention the governor's does. They were also campaigning on different issues. Most importantly, though, Buehler didn't have the name recognition in 2012 that he does today. Even in January, polling indicated Buehler wasn't a household name, as a DHM Research poll had him at 29 percent. While it's true that the number of registered Democrats is increasing in both Washington and Clackamas counties, their percentage of all voters is declining slightly, from 40 percent in 2012 to 37 percent in 2018 in Washington County and from 38 percent to 34 percent in Clackamas County, according to voter registration statistics from the Oregon Secretary of State's Office. Republicans' percentage has dropped more steeply in both counties, from 35 percent in 2012 to 29 percent in 2018 in Clackamas County and from 31 percent to 23 percent in Washington County. Nonaffiliated voters' percentages, meanwhile, have burgeoned in both counties because of automatic voter registration, from 21 percent in 2012 to 30 percent in 2018 in Clackamas County and from 24 percent to 33 percent in Washington County. While Secretary of State statistics show that nonaffiliated voters are less likely to turn out, their presence injects a wild card in the election results. "It's still Brown's race to lose," Moore said. "It's partly because this is a Democratic state and partly because he's just got a coalition of gnarly Republicans, centrists and Democrats together. When he talks to Republicans, he ticks off Democrats, and when he talks to Democrats, he ticks of Republicans. It's just really tough to make that work." Analysts were quick to point to Buehler's strategy of pulling to the left to court independents, undecided voters and even Democrats. He often says what Oregon needs is a leader, not a partisan, and he is a leader for voters of all parties. But will it work? Several pointed out that as Buehler takes stances that will play better statewide, he is straying from his base, which can be a risky political strategy. "The liberals are going to vote for Kate, and the conservatives are not excited about Knute, but when it comes down to it, the (conservatives) who are going to vote are going to vote for him," Nashif said. "So it's a matter of who is energized enough to go to the polls." Toll said Clackamas County voters are keyed into the election, as it's all over TVs and newspapers. He said the race will be tight, but predicted Brown takes the county by about three points. "Kate is perceived as a solid governor, but not a flashy one," Toll said. "Whereas her opponent is considered a solid opponent, but dull and predictable." Nearly all analysts interviewed for this story brought up the millions of dollars – totaling $20 million and counting -- being poured into the race. Horvick said writers of the large checks being written for Buehler obviously believe he's got a chance. Looper said he thinks Buehler will end up outspending Brown, which will keep him in the race. Political analysts can use data to pinpoint swing voter blocks, issues of concern or gaffes that tank a candidate. But they can also look at historical data, which shows it's been 39 years since a Republican won the governor's seat. "At the end of the day I doubt the race actually gets decided on issues," Looper said. "I think this is going to come down to character and trust."